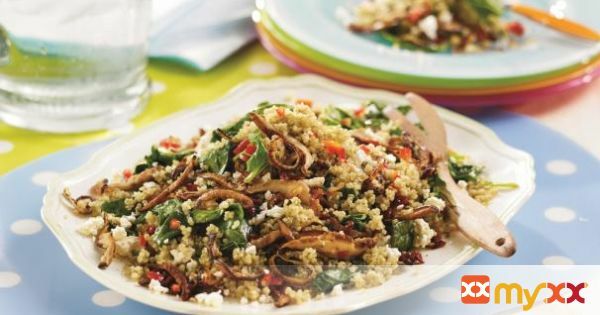 Delicious seasoned quinoa forms the base of this warm greens-and-veggie side salad. Leftovers make a great packed lunch. 1. In saucepan, bring chicken broth to a boil. Stir in quinoa and contents of seasoning pouch. Reduce heat to low, cover and simmer for 12 to 15 minutes or until tender. Remove from heat; let stand, covered, for 5 minutes. Fluff with a fork. 2. In large nonstick frying pan, heat oil over medium heat; cook shallots and red pepper for 4 to 6 minutes, stirring occasionally, or until lightly golden and softened. Stir in mushrooms; cook, stirring occasionally, for 6 to 8 minutes or until mushrooms have released their juices and are starting to turn golden. Add vinegar; cook, stirring to bring up browned bits, for 1 minute. Stir in spinach; cook, stirring, for 2 minutes or just until wilted. Stir in salt and pepper. Remove from heat. 3. In large bowl, toss quinoa with warm spinach mixture. Serve sprinkled with feta. 4. More recipe ideas are available online at pc.ca.